No one has added a helpful site for this 2007 Camry problem yet. Be the first! 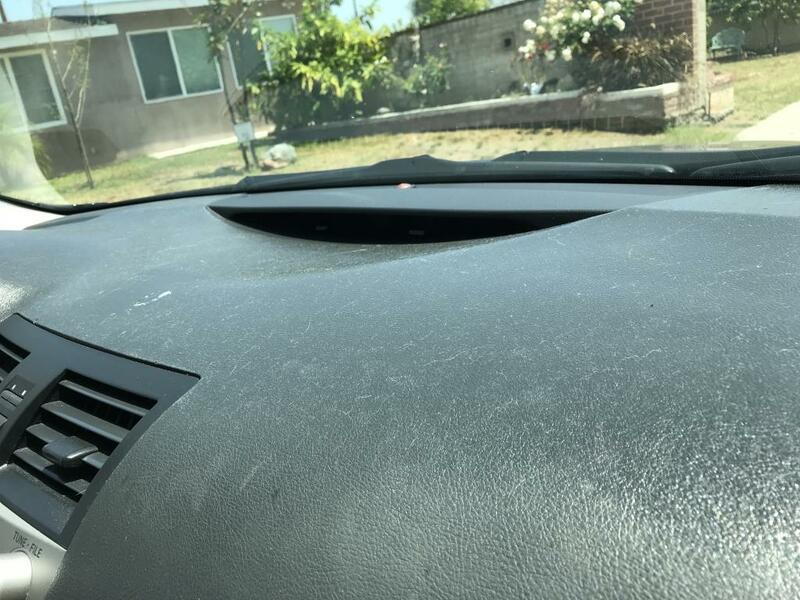 This prevents you from placing anything on the dash because Anyang you put on it will stick and also just rubbing the surface will leave a sticky residue on your hands as well as take a layer of the dash off. If I could scrape the meal Ted part off and just leave hard plastic behind I would but I know it’d look terriable. It’s not easy to source this part either as I’ve looked online for a while but only found covers to cover it over and this I may have to do. The dashboard has always been really spongy and soft. It is so shiny that the glare created makes it impossible to see anything when driving in the daytime. I really started noticing it more in 2015. I'd clean the dash with a cloth and chunks of it would come up and it was gooey. I never got a letter about it from Toyota so I figured I was on my own with it. Then I noticed a couple months ago they had an extended warranty period on it, which expired May 31st 2017. I still contacted Toyota by phone, and I was told sorry about your luck more or less. I've always thought Toyota was a good brand but things like this really turn me off to a car.. The dashboard is very sticky. The reflection in the window obstructs my view day and night. I wasn't aware of the extended warranty for the melting dash issues, I read an article on line and called the Toyota's customer service number to find out that is already late. Extended warranty period expired on May, 2017. I explained that I was never notified by Toyota, I decided to make a complaint about this manufacturing defect resulting from poor material usage for dashboard molding. The melted dashboard creates a reflection or glare on the windshield that impedes our ability to see the road and their surroundings. 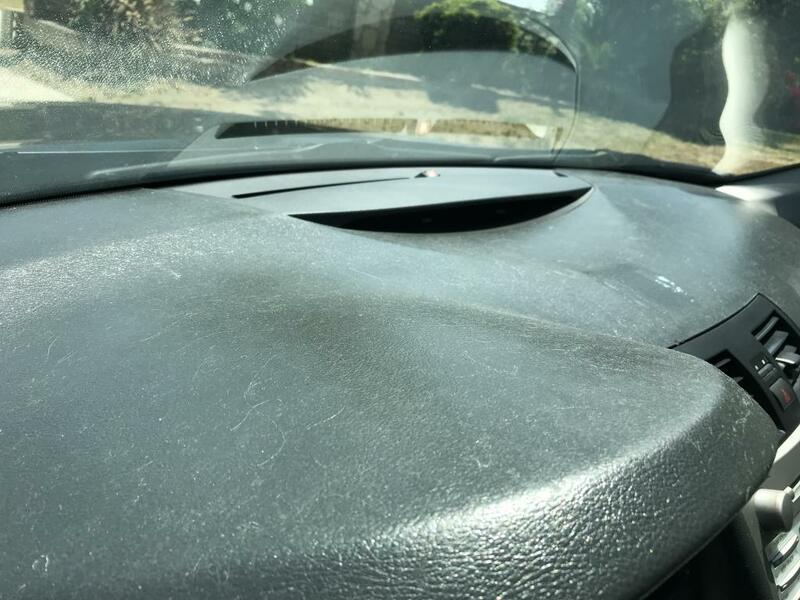 In addition to cosmetic problems, the melting dashboards may also pose a safety hazard, the chemical from melted plastic definitely very harmful. The melted dashboards must be call out by the Toyota dealers. The dash has turned into a sticky goo. It is extremely shinny which makes it dangerous to drive due to the reflection on the windshield. You can not clean it because it is so sticky and all the cleaning rags, towels or whatever stick to it and leave deep marks when you try to get the lint off. It collects bugs like crazy too. 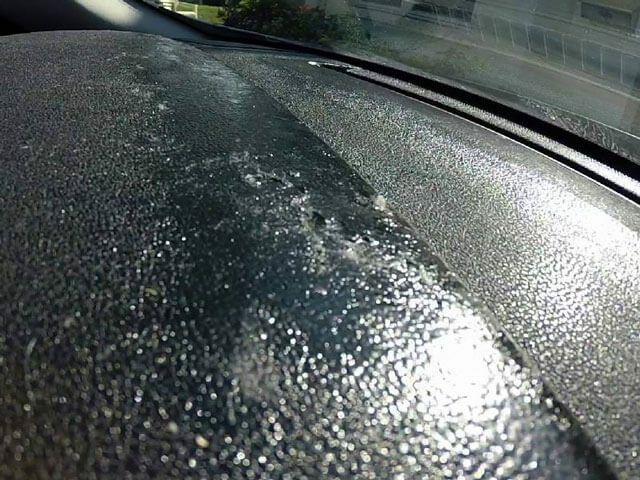 The dash area closest to you isn't as sticky and causes scuff marks bc it gets more contact. Received a "WARRANTY ENHANCEMENT NOTIFICATION-ZE6, "Undated" from Toyota in 2017. Upon receiving my formal notice to repair the melting/sticky glue/gooey honey like mess my dashboard has morphed. Due to the high gloss sticky residue, the glare on my window is opaque white, I can't see to drive,visibility is blocked. The Dealer Northridge Toyota, just shrugged the notice off, saying there are no dashboards available yet, you'll get a second notice. The formal notice says when parts are in I'll be notified. I have talked to the Dealer many times, called Toyota directly, They said "Unfortunately the warrant for this repair expired MAY 31, 2017!!! This safety hazard repair was a SCAM. Toyota never intended to replace the dashboards. They just stalled, and stalled, and claimed the dashboard were not available long enough with a quick expiration so they never would have to replace. My Dash is full of glued melded in dead bugs, bee's, stuck on paper, lint, fibers, dirt, disgusting sticky glue like shiny surface. The white glare makes it dangerous for me to see while driving when the sun is bright on the dash, reflects a white out on the window. Toyota case #1809103728. My mother never received the notice in the mail regarding this recall and was never notified by the dealership who she took the car to several times. I spoke to several Toyota reps over the course of several weeks and the case was elevated to Natasha Ramirez, Operations Supervisor at Toyota Headquarters in Texas, who told me there was nothing Toyota could do. I brought up the fact that Toyota still has several outstanding lawsuits against them in regards to this case and that they are allowing a dangerous vehicle to be on the road. They took no responsibility and no action. Dashboard is melting. Need to replace. Toyota declined to replace it. The dash is sticky and tacky all over. It needs to be replaced and obviously the material used in the dash construction was not appropriate for cars. I never received a recall notice from Toyota. The vehicle was garage kept. I brought it in for service and it was kept overnight outside in the Florida sun. When I picked the car up the dashboard was sticky and shining and made it difficult to drive because of the glare. On the way home I called the service manager and told him what the situation was. I had the car detailed and I thought they had sprayed it with something. I told him how difficult it was because of the glare. He told me to bring the vehicle in at my convenience and he would rectify it. When I brought the vehicle in he informed me of the recall which had ended in May. We heavily discussed the situation but I just gave in and left. I'm a disabled senior living on a small Social Security check and food stamps. I can't possibly replace the dash! So I'm stuck with a dangerous sticky and shiny dash. I can't even use sunshades in Florida because they stick to the dash! I'm sorry now that I brought a friend to buy a 2017 Camry. I hope he doesn't have the problems I'm having. I have been dealing with this sticky, cracking dashboard for 2 years now and it progressively gets worse each summer. It started out a little tacky when it had gotten hot from the summer heat and it has progressed to a sticky, gooey mess that cannot be properly cleaned. It reminds me of those old auburn colored fly strips we used to hang from the ceiling when we were kids. Cracks started appearing last summer and now several more have appeared this summer. I was not notified of a recall and I just found it online this morning while searching for a cleaning solution. I plan on owning this vehicle for at least another 5 years and I fear the dashboard will be an absolute disaster by then. Change or give me a cover to resolve the problem. Thank you for contacting Toyota Motor Sales, USA, Inc. Your case is filed at our headquarters office under your name and file #1805152401. If you have any further questions, please contact us at 800-331-4331. Our hours of operation are 7:00 a.m. to 7:00 p.m. CT Monday through Friday and 7:00 a.m. to 4:30 p.m. CT Saturday. Please do not attempt to respond to this message. We cannot accept electronic replies to this e-mail. I read that there was a recall for the sticky, melting dashboards on Camrys so I did a search for recalls using my VIN #. Nothing came up, so I contacted Toyota directly and was told that the recall expired in 2017. This didn't occur in my car until late 2017 and I didn't have a chance to contact Toyota until the beginning of 2018. They said the dash could be replaced, but it would be at my own cost. They offered no other solution. Also, couldn't tell me the cost to repair. I'd have to go to a dealer for a price. The dash is so sticky that I can't clean it in any way. I have dead bugs and dust stuck to the dash and when I try to get them off, it just causes more of a mess. I don't keep my windows open when the car is parked, but dust and the occasional bug find there way into the car. It's completely disgusting! I PURCHASED THIS USED CAR BACK IN 2014. THE DASHBOARD HAS ALWAYS BEEN VERY STICKY AND SHINY BUT HAS GOTTEN WORSE OVER THE YEARS. I SAW THERE WAS A RECALL ON THIS PROBLEM BUT WHEN I CALLED THE PLACE I PURCHASED THE CAR THEY WOULDN'T HELP ME AND SAID MINE WASN'T PART OF RECALL. I DO REMEMBER GETTING A POSTCARD STATING THAT IT WAS BUT NEVER FOLLOWED UP BECAUSE IT WASN'T THAT BAD. I CAN'T EVEN DRIVE NOW WITHOUT HAVING AN ISSUE WITH THE SHINY GLARE FROM THE DASHBOARD AS I DRIVE. WHAT CAN I DO TO HAVE THIS ISSUE TAKEN CARE OF? Hello my name is greg hollis, my mother -in-law passed away in November 2017 after a long battle with old age and bad health condition,we picked her Car up and found that the dash is a gooey sticky mess almost melted. we contacted the dealer and they said the offer to replace the dash has expired. So here we are with a car that has a bad dash and a bad paint problem. hoping you may be able to help us get this car repaired by Toyota. My Camry has had the sticky dash problem for over a year and I finally did some research about it, only to find out that Toyota had a warranty program that expired a month ago, 31 May 2017. I called them up and they promptly refused to replace my dash. There are still many cars out there that were not fixed and this problem can cause distractions while driving. Can anybody suggest a course of action? Maybe potentially suing them to get them to repair more cars? I bought the car used and assumed the stickiness was residual cleaning product. The stickiness is apparent across the entire dashboard. It leaves a film on anything it touches and feels like glue. It is cracking in multiple places and the melting has caused the sun to reflect into the windshield making it difficult to drive on sunny days. I just called Toyota today when I found out about the recall. They said the initial warranty for the issue ended on May 31, 2017 and my 10 year warranty ended in July. Just two months ago. Two months ago. They said there was nothing they can do. 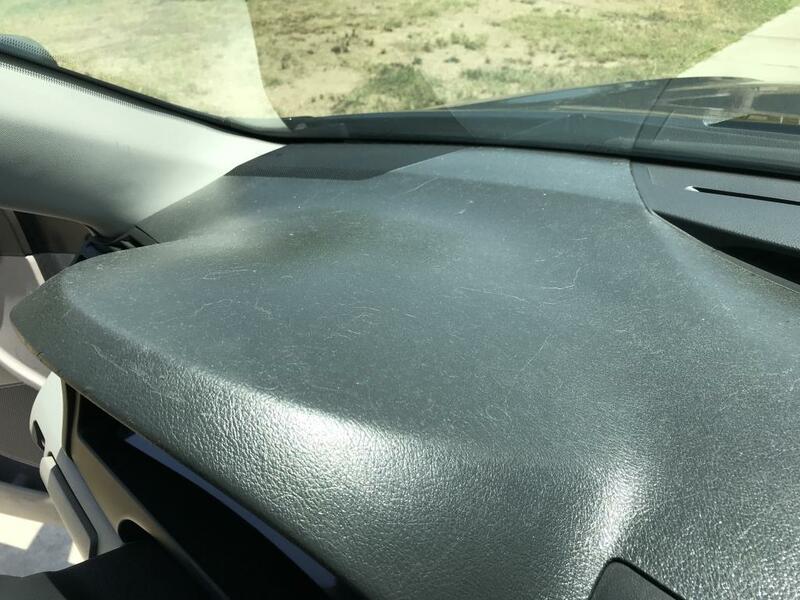 I have a 2007 Toyota Camry and last July 2016, I noticed a sticky spot on the top of my dash. I tried wiping it away but wiping just make it worse. It was only one spot so I did not think anything of it. It has since gotten worse and has spread across the entire dash. I reached out to Toyota on 7/24 and the response was that I missed the 5/30/17 deadline and there was nothing that Toyota could now do. I have since emailed them several times advising of poor customer service. Advised them that if I need this was going to happen I would have never purchased the car. The car has over 135000 miles and is in good condition except for the sticky dash. How can Toyota get away with this?